﻿Soon it will be St Patrick's day, and many millions of Canadians and Americans who proudly trace their roots back to Ireland have cause to celebrate. No, we don't mean people, we mean dogs! We're all probably familiar with the Irish Wolfhound breed, but did you know that the American Kennel Club officially reckognises 8 "Irish" Dog Breeds? "The rich and vibrant culture of the Emerald Isle extends beyond art and literature and touches the very foundation of some of our most devoted and fun-loving dog breeds," says AKC spokesperson Lisa Peterson. "Many of these breeds have been warming our hearts and souls for much of AKC’s long history." Glen of Imaal Terrier – named after a valley in the Wicklow mountains in Ireland. A hardy working terrier, who has the agility, freedom of movement and endurance to do the work for which it was developed. The Glen of Imaal Terrier makes a great docile companion for families with older children. The Irish Setter – The Irish Setter was among the original breeds recognized by AKC at its inception in 1884. Irish Setters have rollicking personalities and require a good amount of exercise They are also loving companion dogs who enjoy the company of children. Irish Terrier – Renowned for their loyalty and friendliness, Irish Terriers serve as mascots for the Notre Dame Football team. Irish Water Spaniel – Another of the original 9 breeds recognized by AKC in 1884and also known at times as the "Shannon Spaniel," the "Whip-Tail Spaniel," and the "Rat-Tail Spaniel. ", the Irish Water Spaniels, distinguishing features are a topknot of long, loose curls and a body covered with a dense, crisply curled liver colored coat, contrasted by a smooth face and a smooth "rat" tail. 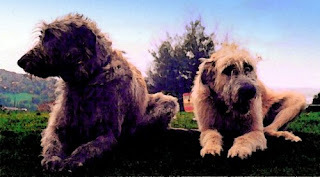 Irish Wolfhound – Irish Wolfhounds were documented in Rome as far back as the year 391 A.D. Irish Wolfhounds possess an extraordinary social temperament, as well as the intelligence to separate friend, family and foe. Kerry Blue Terrier – The "Kerry Blue" from the Irish county of Kerryis known for his superior working and small game hunting skills. Kerry Blue Terriers make an excellent watch dog and herder of flock. Soft Coated Wheaten Terrier – The name of this breed describes the characteristics of the coat–soft, silky, with a gentle wave, and of warm wheaten color. The "Wheaten" is a quick learner and loves to travel with his owners. 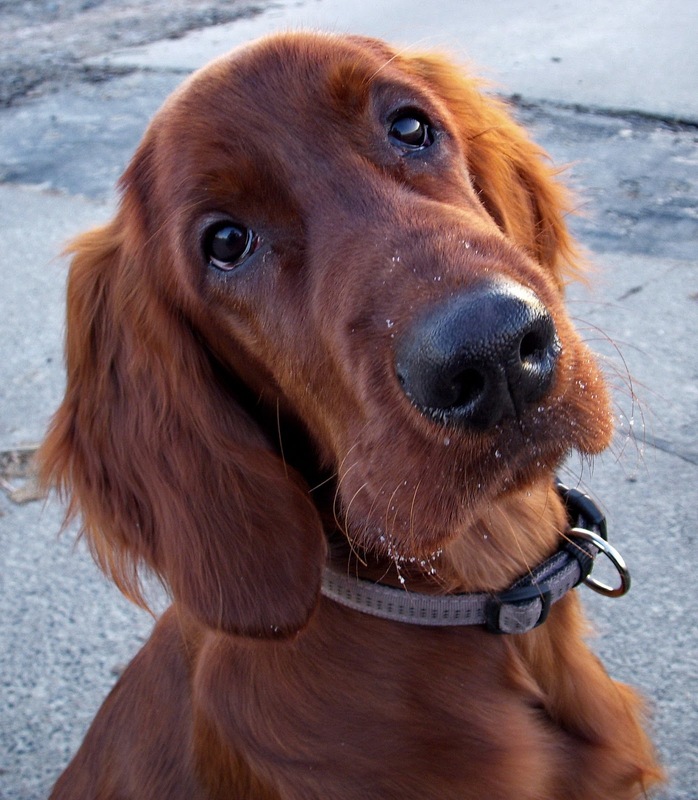 Irish Red & White Setter –The Irish Red & White Setter became an official AKC breed in 2009. Having emerged at the end of the 17th Century in Ireland, the history of the breed is mysterious. Its original purpose was as a versatile hunting companion, providing food for the table. The make loving, loyal companians and best suited for a very active family. Of course, as many of us know, there is a little bit of Irish in all of us, especially on St Patrick's Day! Take Action Early To Avoid Flea Plagues!